Sun, 07/08/2007 - 02:56 Indymedia RASA FM South Africa Soweto This interview was made in March 2006 in Durban RSA. My name is Molefi Ndlovu. I was born in and raised in Soweto, Johannesburg. I got involved with the IMC Johannesburg Collective four years ago. We are trying to raise awareness around struggle in communities-- some of the issues that are facing activists, both in the community and in academic institutions. 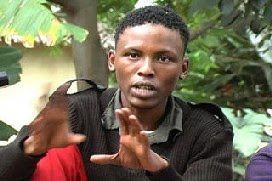 Through indymedia we did video which captured some of the significant events in the South Africa community resistance, but also were participating with some of the major battles with APF and other groupings. Last year we got a chance to consider the idea of a low power radio station, through equipment donated by various sources including the global network of the IMC. We were able to secure a low power transmitter and antenna and some microphones. We called a meeting to get ideas, not only from members of the social movements, but also the broader activist strata in general that included artists, students NGO workers and we started to talk about the possibility of radio as a way of organizing and extending some of the IMC initiatives. We could not host the station in the city center for a few reasons. The first one was obviously the safety issue. In the city center there was much more surveillance, much more observation of activists and closer assessment of what we were doing. But moreover, we thought it would be better and cost less for travel if it were placed right in the center of community struggles. And in Johannesburg in Gautang, the biggest affiliate within the APF was the Soweto Electricity Crisis Committee, which organizes mainly in Soweto, with a long political history of struggle and resistance. After engaging with people about the idea, clearifying our ideas about what is involved, what we needed, we decided to launch the idea of the station. We came up with the idea of “Rasa” which means make a noise. One of our catch phrases was “We mike what we live” inspired by the words of the late activist struggle hero, Bantu Steven Biko, and his lines, “I write what I like.” We would use the station to voice exactly those voices that are put on the peripheries, artistic voices, activist voices, and all others that are put to the sides and put them in the center of what defines a radio station such as this one. The way we introduced the idea to the community by arranging a screening of one of the IMC videos: “Fourth World War” in February 2005 and through that we managed to call young kids, mc’s, activists, politicians, NGO types, all types came through to have a look at the video, but more importantly to take part in the discussions of the station. 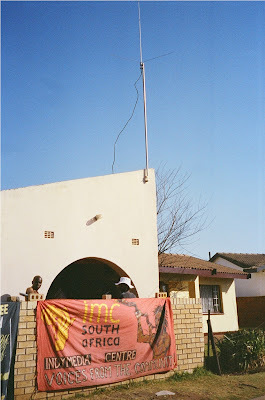 Some SACC comrades and APF and indymedia thought that we could house the station in Pimville at the back of Comrade Trevor’s small garage and we could clean it us and put it to the level where it looked something like a studio. And that’s what we did. 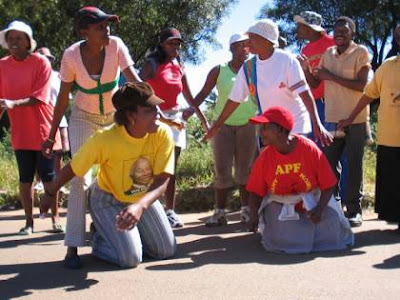 The APF is an organization that is in the forefront of community struggles in Johannesburg. It is an emerging social movement that arose out of a response by municipal workers that were opposing a new municipal plan, EGOLI 2000, which was basically a new plan for the city of Johannesburg to put itself along commercial and corporate lines, which would include to get rid of all its worker facilities so that all of them would be put in an out-sourced entity. At the same time, there were students within the universities, especially WITS (Witwatersrand University) where similar ideas were being pushed called WITS 2000 along similar lines: to make sure the university would become a marketable competitive place where financial and market related skills were prioritized. Many schools, especially in the humanities were collapsed into each other. Programs were shut down because they were deemed unmarketable, or not useful for corporations, also students would be the primary way in which the university could raise its finances through emphasis on payment of user fees. But what the model of this new WITS 2000 was suggesting was that the primary way that the university could raise its own funds was through student fees and used fees from the learners so that most of the students who could not raise their own resources to get into the university could not do so. This in the face of a shrinking pool of student financial assistance resources which effectively served to exclude students from disadvantaged communities before they could even enter the academy. The leading progressive organization at this stage was SASCO, South African Student Congress, which was allied with the ANC, but some of the comrades within SASCO became very vocal, noticing the relationship between these new policies (WITS 2000) and EGOLI 2000 and the overall macro-economic reorientation of South African society towards the objectives of what is now called the Growth Employment and Redistribution Policy—GEAR. APF arose out of the need from these various sectors. In communities, people were seeing that municipal services and things like water and electricity would fall into the new corporatized, outsourced companies who would be charging user fees to people who could afford and those who could not afford would not be given an option. Prepaid electricity, prepaid telephones, prepaid water, prepaid everything were starting to emerge as a way that these new corporatized entities would make a profit out of service delivery. 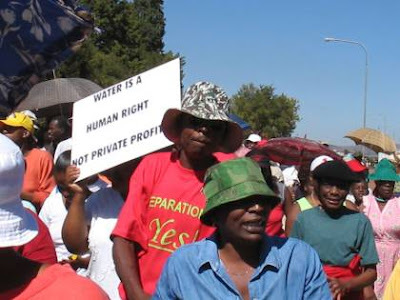 The anti privatization forum (APF) was mainly a coming together of activists facing some of the problems that privatization imposes, to students, to the unemployed, to the old people in the townships, to families that were not able to afford a decent standard of living and could not afford their services. So it was a coming together of all those people. The major turning point was when the APF had clearly identified GEAR as one of the corner stones of the problems that unite so many people precisely because of its neo-liberal approach and its positioning privatization, reduced spending on social services, etc., as the only way to go forward and nothing else. The APF arose and began to mobilize and organize in different sectors, especially within communities where we saw a re-emergence of movements, civic type of organizations, residents associations, unemployed youth organizing themselves and in a series of protest actions, workshops and activities made the organization found its form. It is through the work that APF has done and the types of activists identities that it has been able to engender that we are able to now have an almost city-wide and also a provincial-wide perspective on some of the problems but it also meant that we were able to connect up with other areas in South Africa, particularly in Kwazulu Natal where we were able to organize together with the Durban Social Forum, an alternative event from what was called the World Conference Against Racism which happened in Durban 2001. Even there the emerging social movements were beginning to find their voices and beginning to write out certain common agendas of resistance and solidarity building. As part of how the APF functions, we acknowledged that there are various issues that we need to deal with as an organization. There are various focuses that different communities would have. The purpose is not to make them one; the idea is to find ways through our diversity and interests to build something that is common amongst us. Thus the structure of the APF is such that we are able to have the education committee, the water privatization research committee. We have a media sub-committee, a committee for local elections, governance; we have an organizing committee and so one. In these various committees different activists and organizations find their space to make their interventions in relation to what organizations they stand for and what are the long-term objectives of it. The nature of discussions and decisions is such that is allows for democratic decision taking where we have what we call a coordinating committee where all these various sub-committees come together and they discuss various things, and that is where we would take the ultimate decision about the position of the APF thereafter. The interesting thing is how indymedia Johannesburg has been able to evolve within the APF itself. The Indymedia collective never saw itself as completely outside of the APF, in so far as most of the active indymedia comrades were also quite active in the media sub-committee of the APF. Thus all of the discussion, of what do we produce, how do we produce it, where do we get resources, etc, do happen within the indymedia collective, but also are opened up to broader participation by members of the APF as a whole. So it was only fitting then that once we had this idea of a low power radio, that we locate it within that space has been created, that alternative media needs to be part of the ways in which we engage and resist the forces that are trying to push us down. RASA FM became part of that possible imaginative space where people could not only speak about their problems and issues about society but also participate in creating some of the alternatives, making their imaginations come to life, drawing in quite a lot of young people. Often in the APF we would find a lot of young people are very keen but their participation had been limited only to the issue of education, because that is one of the biggest issues that are facing young people, the issue of access to education also the issue of those who are out of school, and are unemployed and are therefore not able to get into the educational system. Through media, through radio you could get some of these out of school youth unemployed young people with interesting ideas about what they want to create to be part of a very organic alive project that also gives voice to the general positions that people want to be voicing that have been shut down by mainstream media. When we started broadcasting it was something close to magic. That is all I can describe it as. We had been speaking, workshopping, calling meetings for at least five weeks before we even touched the equipment, trying to clarify what the station would be, what the programming would look like, how everyone would sort out their time, who’s going to do what. We spent weeks and weeks going to this little garage. None of us had been involved in a radio station, let alone producing things for a station. It meant that people had to go into libraries, read out on how you do a program schedule, get people to find out how to interview people, how to find information in the libraries and report news that matter to our communities. We launched the station on June 16 2005, the national holiday (which is the anniversary of the Soweto Up-Rising), which celebrates the attainment of liberation by youth—there is a heavy reference to the role that youth have played, such as the Soweto Uprising. We thought to use the session to make the political argument to say that the conditions of young people have not really changed that much, especially if they are black and are from poor backgrounds. Since we didn’t have any sense of what we would be saying on the air, how we would fill the hour, we decided to hold a session just before June 16—on June 11. We invited poets, artists, musicians, graffiti artists, bikerboys, everyone. We just made a nice session in a courtyard in one of the parks in Deep Kloof. The plan was to get as much of that session recorded as possible so that it would be the basis for a show on June 16. We didn’t have much equipment. We had old tape recorders and things like that—some of the people that have now become the core group of the collective—young kids between 16 and 25 walking around with notepads, interviewing people, calling people from the streets trying to find what they would want to say about June 16. It was good for us to have a theme because it meant that our programming would be a bit smoother. Also it meant that we were able to draw a pool of people who would be at the station on the day of the launch so we could have interviews and discussions that could last the four hours we had planned for. We were panicking about the timing about whether the transmitter could blow up, what we would do. So most of us slept at the station writing out scripts, preparing the show, and finalizing the program schedule for the day two weeks by launch day. By the morning of June 16, the program schedule was looking absolutely beautiful. We had the material that we had recorded from the sessions, but we had also all of these people we had lined up for interviews. We had managed to compile a sharp music play-list for the different shows. We managed to segment the shows into different themes and time slots. 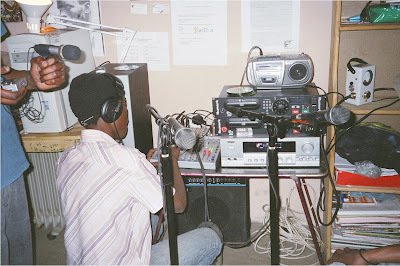 We were supposed to start the transmission at 12 noon where people were supposed to then listen to their radio station. But I tell you, by 9 o’clock, there were people filling the small garage, wanting to know why we were not on the air yet. So we were pushed to start the station sooner than we thought. So at 11 o’clock we announced we were officially on air! 104.5. WE MIKE WHAT WE LIVE! There is no feeling that could ever describe it. It felt like we switched on something that had never been switched on before. The whole area was just abuzz with the "surround sound" effect of the station. We had phone calls from everyone, saying we are getting it in one part of Soweto, others saying we are receiving it in another part. More people were getting the station and the yard of comrade Trevor filled up. By the time 2 o’clock hit, it was almost a stampede. We had to open up the garage door and put some chairs out for people to sit. It became a session on its own. We had comrades from the anti-privatization forum, the SECC, but also from other areas, from the Vaal, Pretoria, East Rand, young kids that left home at 6 o’clock in the morning to get to the station. We saw in each other, the people who had been working so hard to get it started, rising confidence in the knowledge that what we have started is quite amazing. Whereas we had planned to broadcast for 4 hours we ended up going all the way until midnight! That 's the scope of the demand. We couldn't get people out. The people in the neighborhood, the aunties got so excited when they heard the voices of their sons and daughters on the radio. They would come there with all their grandchildren and send their dedication to the rest of the family. We realized then that radio broadcasting was not a concern of special people. It wasn’t this magical thing that some magical people that have skills that no one else has access to except if they were involved in existing stations. Here was a medium that they could take direct control over, to hear themselves and speak of their of issues and determine how it sounds and what music should be played. For the week that followed the launch, we pushed a schedule of 12 hours running. We had to really work fast in our heads. Initially we had an idea of four hours of nicely packed segments, we had to revise it quite dramatically. It also meant that some of us that were involved in the station needed to plan around how we distribute our time because it meant that we would have to be at the station for most of the time. We wanted to make open and regular meetings part of the functioning of the station. We decided on Wednesdays as open forums where community members, keen people that wanted to contribute, people that had skills, people who could criticize quality and content could meet and discuss. So on Wednesdays we would invite different people and that’s how we saw the collective growing from a group that was initially about 15 people to well over 30 people, all of them interested in one aspect or another. It gained a life of its own. The changes we put in place were dictated by the circumstance the station found itself in. We had to work in terms of collectives to allow for broader participation. We were trying to get away from this thing of the leader or the manager to develop a model of collective action. So because the responsibility for programming was a major part of the station, we gave that responsibility to a collective, not an individual and within the collective, chairing roles could circulate. We were breaking down this thing of responsibility so that we all took shared responsibility. We had one collective that was dealing with technical aspects of the station, so that we had people trying to make the sound a little bit better. But also, we had people who were dealing with other aspects: how do we build alliances, especially with the awareness that even though the idea was explosive, and most people were taken with it, the radio could be in for serious attack by certain segments—especially the government and the broadcasting authorities. So we created a way that different people had different responsibilities. Also because of the fact that many of the people who were part of the collective were still in school, some of them were going to the university, others had small jobs, most were living far from the station, so there were things that we needed to sort out around the schedule and time available. There is also an idea that we wanted to build: the idea of Rasa, not only a radio station-- what we wanted to build is also an idea of a movement. We see RASA as part of the general movement, not as a separate thing, not objective and standing outside, but as a subject and an actor in some of the issues that are being tackled by communities. Our entry point is precisely the issue of free community media, more importantly, a participative form or model of community media production. These models do not exist at this moment in South Africa. What is called community radio in South Africa, are radio stations that are legislated to be “community” by law, but which have taken up models of operating that are similar to main-stream radio stations. Their concerns are linked to commercial radio stations—issues about listenership, about marketability, about raising money and interpretation of sustainability as profiteering. For instance the biggest critique that the young artists that we had included in some of our activities had to say was because they were not able to get into studios and record using fancy equipment because they were not able to afford to have expensive producers that the mainstream recording companies had then their voices are being systematically shut out. Most importantly, as well, was the aspect of actually how are these cultures or social activities chosen? 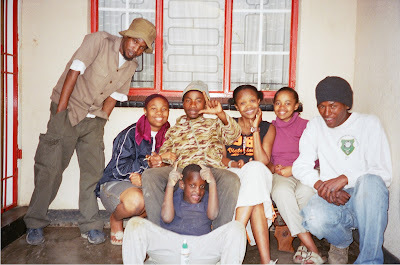 In South Africa, for instance, in terms of music, there is this genre of music called Kwaito, which has been often touted a being a genuine South African creation that expresses the South African subject, especially the youth, urban life and radical ideas and construction of identities. What we have seen happening is the Americanization of the genre, so that it starts copying some of the aspects of mainstream R and B of the United States. As a result young people have started to look for outputs or alternatives to the totalizing culture of “bling bling” superstar and those individuating conceptions. We see the rise of underground hip-hop as a cultural form of expression, but also as a social form of interaction betw2een people, especially people that are sharing a certain social political orientation, but also an economic position in society. These young kids that are often not from well off backgrounds, that don’t necessarily share the values that are being put out by main stream music, especially Kwaito. They want to say no, we choose to express ourselves in a different way. We choose to have different heroes as representations of ourselves. We choose to use spaces that we occupy differently. As opposed to commercial spaces where we are just fighting about our intellectual rights to the property that we produce, we are saying that we can share the knowledge, we can share the production. The music that we sing is an expression of where we come from, where we are going and whom we are going there with. That space has not been available to many of these kids, and so that’s how we are also able to break down the divisions between the social movements such as the movements that are fighting for the basic services and the movements of young people, artistic people, intellectuals who are all disgruntled with the way this consumerist hegemony has taken hold of everyone’s imagination and the need for alternative spaces has become more urgent. So we were able to do the programming to include these approaches. Programs were mainly focused on content, which was talk content and the content was generated by an idea of finding out some of the issues that were raised. For example, we would take an issue which is a burning issue in the social movements, especially in the anti-privatization forum in Johannesburg: the issue of water privatization and we would get different people to give different perspectives on it. We would draw out some of the knowledge that is out there, for instance some of the facts that we have generated through the research sub-committee, reports by different social actors, NGOs, academic units, practicioners that have shown the effects of privatization of basic life-sustaining services has had on poor communities. We would express it through the lived experiences of people who live in these communities, who don’t necessarily see themselves as T shirt wearing, card carrying members of a social movement but just members of a community that has found itself sidelined and silenced. So the station was a powerful thing in those regards because it opened up some of our own preconceptions of what we thought we would be doing. When we first imagined it, we thought it would be a mouthpiece for the social movements, raising the level on critical debates carried out by these groupings. But the station started defining and deepening its own character, through its interactions and the voices and expressions from many different people with different approaches. It generated an identity of its own, something that would be equivalent in commercial or main stream thinking as "Branding” was a living discourse oriented towards change. In this sense it was an identity that wasn't linked to an issue of exchange value. The first three months we worked together quite well. We had a common sense of what we were trying to achieve. But slowly as people got a bit more comfortable and sussed with this idea of a radio station, differences started showing up. There was an issue of approach. When we started it off we wanted to get away from some of the mainstream ideas that are out there, in terms of the con tent, but also in terms of the music. We consciously wanted to find different ways of creating and doing things. Tensions came about as we got more people involved in the station and people became quite aware of its huge rise in popularity. Some were saying that people want to hear popular music—that we could increase our listeners. So we had to adjust some of our content to accommodate the sides of the people who had tuned it. To some extent there was accommodation, but at some stage we had to say that we had to choose whether or not we wanted to build a real alternative or fall into the trap of chosing blindly, listenership quotas and getting embroiled in a popularity contest with some of the established radio stations. The other think that was hitting us was that the station did not have any funding whatsoever. We practically were living out of our own pockets and tghose people who were supporting us—family, friends, etc. For example I was unemployed. Most of the people that were in the station were unemployed. There was no way we could raise money for even simple things like a cassette so that we could record some of the shows that we were having. We couldn’t raise that sort of money. We would be sitting at the station from 6 AM which is the time when we arrive—all the way until 9 PM and there is no food and it just became quite depressing in so far that we were not able to reach the most basic things that could help us do our work better. Then the argument for us to become a bit more commercial became that much stronger. Some among us started saying if we were to sell advertising space to be a bit more oriented to a wider market, that we could have more possibilities for selling the project as a way of raising funds through advertisers. Then the station could buy CDs if it needs CDs. It can buy all sorts of things. Slowly and surely participation then became more disoriented because it became more of an expense to volunteers, an expense they couldn’t afford, because they didn’t have the means. The cracks came when ICASA finally made an appearance at the station. One afternoon a van from ICASA--ICASA is the regulatory authority that issues broadcasting licenses and frequency allocation. This was after six months of successful broadcasting through all of those difficulties that we had been through. That was the first wave of the lull; it was definitely one of the indicators, a sobering up for most of us. We had been so taken by this enthusiasm and excitement for such a long time. It had kept us going for such a long time so strongly. ‘The reality was starting to hit us. If ICASA were to bring police there. Many participants began to get more worried about their own futures. What would they say at home if they were arrested or fined? There was talk about the station being illegal. People were getting more nervous about the legality of the station—which had been among the first things that we had discussed before we decided to set up the station. We had approached quite a lot of organizations around specifically that issue. The key organization that we were in conversation with was the Freedom of Expression Institute. We solicited advice about what could be done and there was an informal agreement between ourselves and FXI that they would assist us especially around legality issues, finding appropriate laws, finding play B if anything should happen especially around legality issues, finding appropriate laws, finding plan B if anything should happen especially providing a lawyer if one of us were arrested. Also they would help out with the issue, should the station come under fire. Unfortunately, though, not much came out of it. 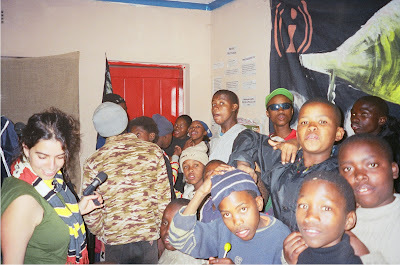 After the first ICASA visit, the station became substantially smaller, in terms of the number of the volunteers we had at the station, but also in terms of how people perceived it. The onslaught was not only physical-- they didn't just come and say you are illegal, get out! The authorities worked on the psychology of the community as well, using other stations that are in Soweto, especially JOZI FM, which had the most to lose because RASA was turning its model upside down because of the radical stance RASA was taking and the alternative that it was offering. It threatened their own claim to be a community radio station. The authorities used the licensed radio stations, they used the newspapers, they used all forms of communicating to the generally nervous population which began to see us as a bit too radical and too illegal. More and more the illegality of it became the predominant attitude which people attached to the station. Soon it became almost criminalized in some circles because it was labeled a pirate station. Because of its pirate status, those that associate with it are criminals and therefore should be locked up in accordance with the law. That's the argument that ICASA pushed and I think to some extent that argument held serious weight in slowing down the focus of the station. We continued nevertheless with our broadcasting. We had to reduce our hours, of course. We had to develop emergency evacuation procedures in case ICASA was to show up. We also had to close ourselves up a bit. When we started, we wanted to open the radio and get everyone involved. We then became a bit more cautious about the information that we were spreading. We became a bit more careful about who knows what. The visit made us self regulate against the general open participative model that we had tried to follow. Ultimately though we put up a fifth, quite a brave fight. We stayed on air for another two months after the first visit. Albeit our hours were much less. Instead of broadcasting from 7AM to 9 PM, we now broadcast from 9AM to half past 6PM, playing some music from half past 6 until 8PM. Our shows became much smaller, more compact and it gave us a sense of clarity about the programming. We had a consistent schedule. We had a consistent number of people that were participating. Each one of the people that were leading a collective that was producing a particular show would do their own research, find the people to interview, raise the issues they would want to. Even though our mass participation model had been injured a little, it helped us to be more clear about what we were trying to do. It became more urgent for us to start speaking about RASA not only as a radio station as It was quite clear that as a radio station they can just turn off the power and that's the way it ends. But RASA was more a calling—a calling to arms for perepheral communities all over the country. The airwaves are ours. Communities have the right to produce things that they deem relevant to them, that express their desires, that also speaks to the sort of life they would like to live. Low power radio can be an alternative radio, not just in terms of quotas and percentages, but real physical participation of people. Ultimately we were shut down and ICASA said that if we were operating in any way, touching any of the equipment, they said they would fine over a million Rand for contravening their regulation. There were also possibilities of jail sentences for those involved. In the midst of this, something awful happened to one of our members, Sihle. He got hit by a car. He was the youngest member and the most vocal and the biggest challenge to some of my assumptions. Sometimes I think I have the right to speak whenever. He was our conscience because he was so young and he was coming on so well. A lot of us were very hurt and demoralized by the accident. He died in the most trivial of ways, our Comrade Sihle. We called him Tracy Chapman, because he would always play a Tracy Chapman song, “Talking about Revolution” at the station. You would know he was on the controls because he would play Tracy Chapman every time. Many lessons can be drawn from the RASA experience. The one thing I am grateful for about the station is that we’ve been able to create friendships, friendships that are beyond just political rhetoric: real friends. All of us friends feel they were part of something special, something that was never done before, that has explosive potential, that thousands more people can do and can improve on. The fact that we were there and we chose to take the risks that we did and we maintained it for the length of time that we did even with all the odds against us, solidified the ties amongst us and stgrengthened the conviction that true community media is a struggle worth fighting. You can talk with anyone from RASA FM and they will tell you that RASA is still very much alive. It still is. The way this system manages to shut down peripheral voices is by isolating them and individualizing them. However, there are many of us, all over the country, all over the world. There are far more of us than there are of those who want to shut us down. There is a trend at the moment, a systematic erasure of our history, a rewriting of what we understand ourselves to be. The whole history of our parents’ struggle and that of generations preceding was about reclaiming the liberty of the African peoples. All of us are being force-fed the new reality of becoming customers of a consumer society. The way we are to understand community media, for that matter, the whole point of being, is supposed to be as customers. Anything that works against the grain of this hegemony is a threat. Even JOZI FM, which poses itself as a community radio station, uses exactly the same corporate formula of management and administration as any private company station, obsessing about profit and surplus. One of their complaints was that if we adopt this participative direct control model the way we are doing it, we could threaten their “market base”. Their clients are companies that are buying chunks of “airtime” for purposes of advertising and they would now be concerned about the numbers of potential consumers shifting from them and listening to this alternative station, which these advertisers do not have access to because of the way the station approaches production of media. So the pressure was that “We have the license and we are the only ones that have the right to produce the media for this pool of consumers “community”. We are the only ones that have the right to represent and construct an understanding of people’s positions and experiences. Anyone else that poses an alternative attitude is a threat directly to our own existence and should be shut down by the use of the most brutal of forces. 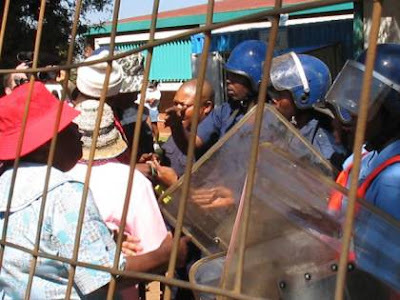 The authorities, the ICASA people are like police in civilian clothes. They do not want anything that undermines the very thinking of the way the system should function. If I was a multi-millionaire, and I went there and I said I want to open a pay channel and I have this sponsor like Vodacom, ABSA, MTM, BP Petroleum and all of those corporations, I bet you I would get that license faster that if I say I am wanting to do participative production by communities themselves. It is less fashionable, more of a threat to them that you are not embracing this new consumer logic. We are customers. The free market has become the end all and be all of existence. All of us relating to each other, not only as individuals, but more importantly as exchangeable goods. The value of our lives is based on the value of the commodities we surround ourselves with. The way we value the next person is how much they can contribute to us monetarily—that is in terms of exhange value. In their minds, there is nothing like free creative living and being and breathing and being friends and valuing things and creating things and sharing them. Right now today in Soweto there are neighbors fighting neighbors because she “stole” drinking water from their metered tap because water now is property. It is like an attack to the very core of our existence, a challenge to defining who we are and what living is all about. They do not want anything that undermines the very thinking of the way the system should function. Yet everywhere people are waking up to the fact that counter-hegemonys are emerging. Our participation in the “barn-raising” event that saw the creation of two other Low Power Radio projects in Arusha Tanzania, organized by Prometheus Radio Project is perhaps an indicator that communities are riding up to the challenge of building the alternative worlds today. The fact that the need to communicate with similar groups globally cannot be stopped by the interests of a minority of exploiters, profiteers and repressors of grass-root voices. and for as long as that remains a reality that faces all of us, then if governments do not give us the rights, then we shall take them by any means necessary. 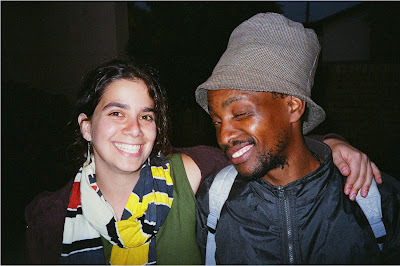 Excerpt from interview with Molefi by DeeDee Halleck, Durban, RSA March, 2006.